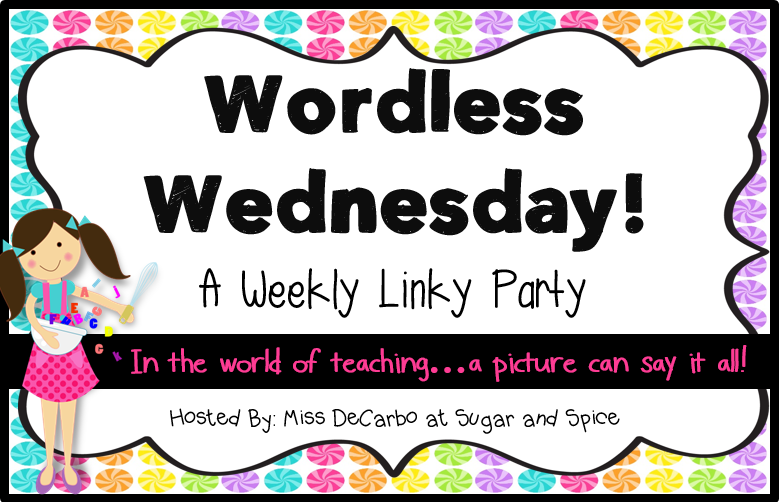 I'm linking up with Miss DeCarbo at Sugar and Spice for Wordless Wednesday to show off a new way to display student work. 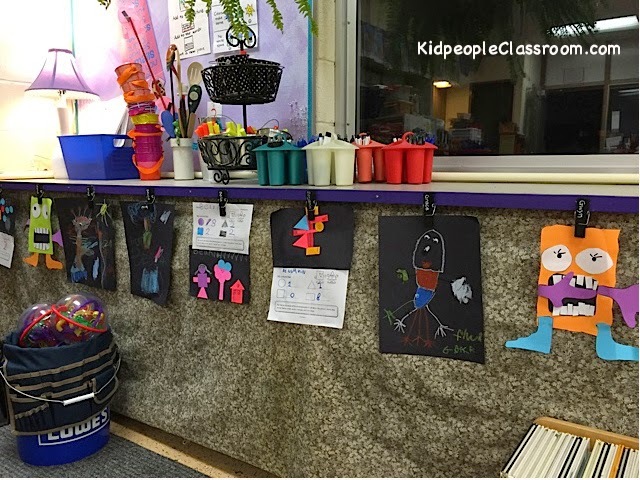 I have student work up in several places in my room and out in our centrum, but I really wanted a spot for the work the kids chose to display, and where they could put it up on their own. The putting-it-up-on- their-own part proved to be a bit of a challenge as display spaces, like bulletin boards, tend to be up high. I finally created the perfect spot, heretofore unused. Yes, this photo was taken at night... don't YOU live at school?? I took a long plastic strip that I got in the lumber department of Lowes. You could use a wooden strip but I find the plastic easier to work with. I used purple duct tape to cover it-- faster than painting and it can't flake off. It fit so that the edges of the tape wrapped around to the back on the top and bottom edges of the strip. Then I screwed the strip to the edge of my window counter ledge. I suppose you could skip this strip step and just use the edge of the counter, but I wanted to mess up the counter edge as little as possible, and gluing 20+ clips directly to it might have left too much mess. This way there will only be some very small unobtrusive holes in the counter edge when I'm gone. And I think the purple edge makes it look "on purpose." The color theme of my room is sage green, gray, and purple. Close up– see those little screws? I got wide black clothespins at Michaels and wrote the kids' names on them with white chalk pen, also found at Michael's. I needed a few more clothespins than they had, so I bought plain ones and spray painted them using black chalkboard paint and it worked just fine. The white chalkboard marker stays on as the kids use the clip, but if I wet it, it wipes right off– handy for putting next year's crop of kids' names on. The hot glue gun did the job of attaching the clothespins to the strip. I spaced the clothes pins so that student work (of 8.5x11) could hang in either the vertical or horizontal position. I have fabric "curtains" that cover all the stuff on my shelves- makes for a much cleaner look– and the kids' work hangs with the curtain as a backdrop. Now the kids can hang whatever they are proud of in their own designated spot, and change it in seconds. I am happy with it and so are they! So, how do you do student display? Do you let them choose what goes up? Have you found a way to let them put it up by themselves? Is this photo and post helpful to you? I hope to hear! Now click on the Wordless Wednesday button up top to find more good stuff! Have a great week! Love this idea. I have two areas that I have clothespins to hang work, but it is much too high for the kids to reach. I also have a "quilt" display area, courtesy of Pinterest. I usually have one board with a writing sample, one with an art project and one with a math or science/social studies project. I do like the idea of giving them the choice of what they want displayed. I may try that. Thanks for sharing! What a great idea, Kathleen! I created a special board and divided it into sections using string. There was a piece of construction paper with the child's name as a place holder. A push pin held a binder clip in place. The work of the week was placed on top of the construction paper. Sometime students chose the work; sometimes we had a themed display. Parents loved knowing right where to look to see their child's newest special creation.